I don’t know about you, but the kitchen is where I spend a ton of my time when I’m at home. Maybe it just feels that way, but it seems like I am in there all the time, making food and cleaning dishes. Our table is in the kitchen, so this is where we all sit down for our meals, plus the kids and I use the kitchen table for all sorts of projects. It also is one of the hardest places in my house to keep clutter free since we are in it so often. I am very crafty, love to cook and bake, but my mind needs a clutter-free space to be motivated to do anything. In addition, an organized, clutter-free space makes it easier to find what you need, relax and be able to enjoy the space. It can be difficult to figure out how to organize your kitchen just so and declutter it. Here are some ideas on how to achieve a clutter-free, organized kitchen. 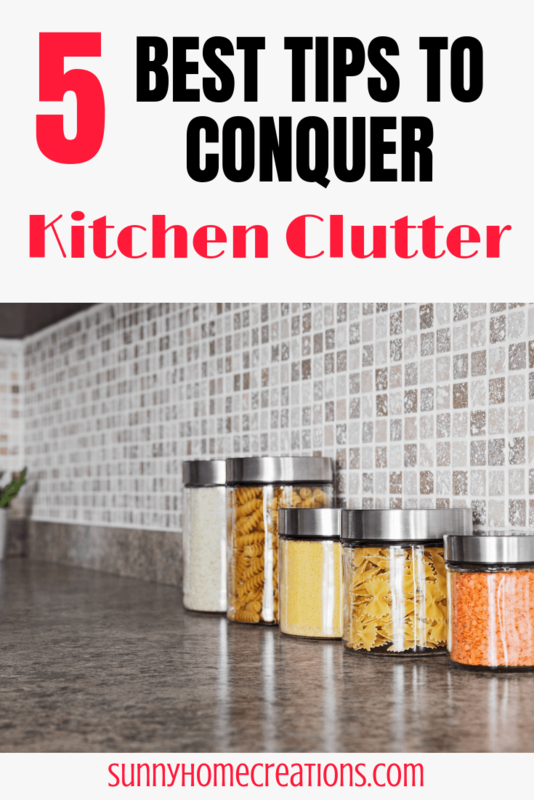 The first thing you should do is figure out what exactly needs to stay on your counters and which items can be moved somewhere else or that can be gotten rid of. If your kitchen is really large, you may want to divide up your kitchen into “zones” and tackle them one at a time. Organize the items you have into groups of the same. So for example, all your utensils could be put together and all your mail as well. Make sure to get rid of any garbage that you have on your counters as well. Look over the appliances you have on your counters – are there any that you don’t use that often? These are the ones that can be moved into either a cabinet or some other closet to store them. If the items are something rarely use, maybe just a couple times a year, you can also store these in your attic if you don’t have room elsewhere. For the appliances that are on your counters, make sure these are ones that are used several times during the week. Cooking Utensils can make the kitchen counters look extremely cluttered and disorganized. If you don’t have the space to store them in a drawer, then use a container such as this one to keep them together on the counter. There are so many different containers you can use to store your utensils. Make sure to put the container with your cooking utensils near the stove where you will be using them the most. This makes it easy when you are cooking to just grab what you need. Mail, it seems to multiply if you don’t sort through it quickly. I know I have a bad habit of setting my mail onto my counter for “later”. This makes the kitchen look cluttered fast! If you don’t have a spot to keep your mail until you have a few minutes to go through it, you can create a space to hide your mail or if you have the wall space you can get an organizer to hang on your wall. You can use a storage unit that can be hidden in one of your cabinets. It’s easy to have bags and boxes of fruit laying on your counter, especially when they are in season and so delicious! One way to contain all the fruit is to keep it all in a large bowl or a basket. You can find some great baskets to hang from the ceiling with several different sized baskets to hold your fruit. 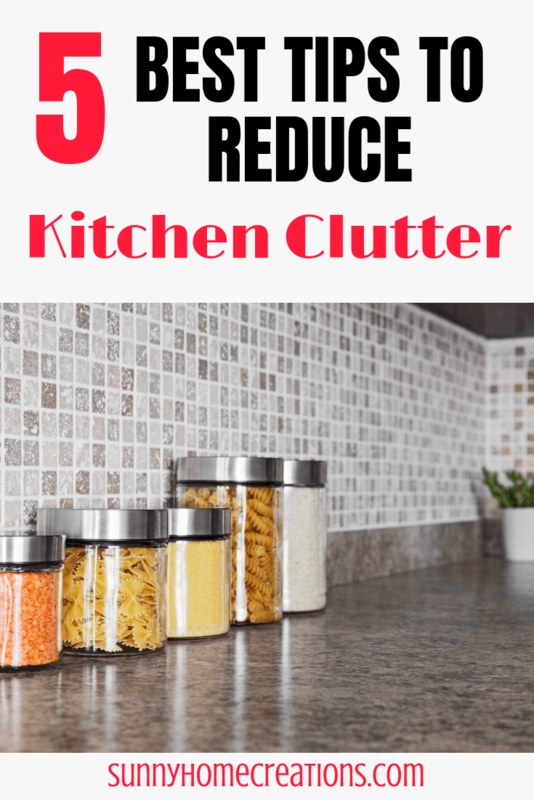 I hope you found some easy ways to keep your kitchen clutter-free. Feel free to Pin this post if you found it helpful. Cleaning Tips to Keep Your House Clean ALL THE TIME!